Always lives up to expectations. We had a wonderful stay at Roundhouse Barns. It's a brilliant location as a base to get around and scenic walks. The accommodation is always first class. Can't wait to return. Great accommodation, very clean and comfortable. A home from home with everything you would need. The bed is so comfortable, no expense spared. My husband and I had a wonderful week away. St Just is so beautiful, there are many walks from the property and St Mawes a stones throw away. Excellent accommodation, very well equipped with a lovely large comfy bed. Very quiet location with walking on the doorstep. Many thanks or your lovely review. We're pleased you enjoyed your break. What fantastic weather you brought with you!! I would thoroughly recommend a stay at the Carthouse, Roundhouse barns for accommodation that provides every need with cleanliness and stylish decor in mind. Perfectly located on the Roseland Peninsula, a scenic beauty. So much to see. Out hosts were friendly and respected our privacy. Nothing was too much trouble. We had a wonderful short break, everything was just perfect just as we thought it would be thank you so much! Cannot emphasise how good this cottage is. It is without doubt the best we have stayed in....period! Add the owners attention to detail and attentiveness and you have a perfect storm of a holiday. I whole heartedly recommend staying here! The perfect break - you won't be disappointed. “We just wanted to say thank you for, once again, a lovely break in the Cart House. 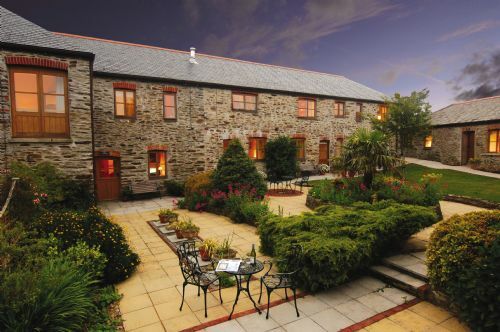 We always look forward to coming down to Roundhouse barns in sunny Cornwall. Never been disappointed. Looking forward to a return visit in the near future. Again, many thanks to Mark and Barbara for your hospitality. It was very clean and tidy got some lovely walk to go on. Was very helpful when needed. Nice shops. Was a lovely stay very clean and tidy and was some lovely walks to go out on. If we had any problems they was dealt with very quickly by Barbara. But the only dwn fall we had was we never got introduced to Barbaras husband were we was staying which I think is very important when running a business people like to see both couples. Would return back in the future though. Another lovely stay at Roundhouse Barns. Picturesque surroundings, beautiful accommodation with lovely hosts. Stayed here a number of times and booked again for 2018. Can't wait! The accommodation was of a very high standard, plenty of space and storage and very well equipped. 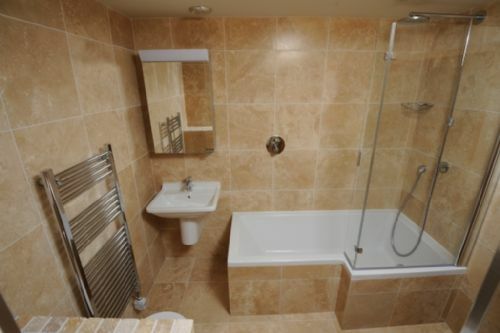 The location is within easy reach of the sea and there are many walks in the near vicinity. It was extremely peaceful and relaxing with a number of pubs serving good food within easy reach. We have stayed at Roundhouse Barn Holidays many times and stayed in The Carthouse a number of times as well. For us the property delivers on all levels, being quiet, a highly specified cottage and a very comfortable bed you cannot fail to feel relaxed at the end of your holiday. We liked it so much we stayed for 3 straight weeks and I suppose that speaks volumes. Thank you so much B&M. Very well finished accommodation in a fantastic location. The previous August we had stayed for a long weekend at the B&B suite for a special birthday. Absolutely loved the accommodation, the very friendly and welcoming nature of the owners, Barbara and Mark, and the setting away from the bustle of a busy resort but still within easy reach of some great locations. We loved it so much that we booked into one of the self-catering cottages for the following May before our stay was over. On our arrival in May there was a lovely touch, acknowledging that we were staying for our wedding anniversary. The owners must have remembered (or at least taken the trouble to note it down) at our previous stay. This little touch was the perfect example of the care and effort taken in running Roundhouse Barns and making sure that your stay is a pleasant one. On both occasions nothing was too much trouble for Barbara and Mark. From pointing out the best places to eat and shop locally, providing tourist information or just having a friendly chat the levels of customer service were excellent. From the efficiency of the booking process through to the warmth of the welcome, the cleanliness of the cottage and the high qualityof the fittings and even the opportunity to dig up our own new potatoes from the vegetable garden this was a perfect place to stay. Very warm welcome again from Barbara and Mark. Our accommodation was clean, comfortable and with a cream tea awaiting us in the kitchen who could ask for more. This is our fifth stay at Roundhouse Barns, the location quite and peaceful and the weather this week was a bonus, it was Cornwall at its best. Despite relatively poor weather we had a lovely time staying at the Carthouse. It was so quiet and peaceful and has some nice walks straight from the property. The owners tips on walks, places to visit and places to dine out at, or get food for dining in, were very useful. 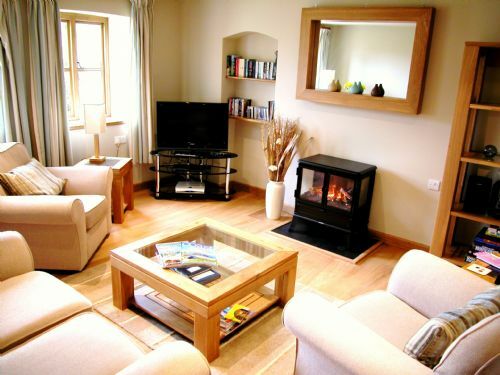 The cottage is very comfortable and is very well equipped, We loved it. We enjoyed our stay in the Roundhouse which is a very comfortable, well equipped cottage surrounded by beautiful countryside. ing holiday in an ideal location - extra bonus, wonderful weather this Easter. My husband and I wanted a Xmas detox and this was the perfect place to do so! Barbara and Mark were really great hosts, and when we arrived there was a generous spread laid out for us (box of celebrations, bottle of wine, scones, Xmas crackers etc). The cottage is lovely and in a beautiful part of Cornwall. There are lots of picturesque walks nearby, and many more further afield. It's a great base for a relaxing countryside break. The property looked lovely on line but was better in real life. Absolutely immaculate throughout and the owners Mark and Barbara, have put a lot of thought and effort into providing everything you could possibly need and more. It was a little home from home. As we stayed over the Christmas period they also added lots of extras like a decorated Christmas Tree, wreath on the door, wine, chocolates and food treats. Completely unnecessary but hugely appreciated. As another of their properties, Cockle Cottage was unoccupied and had a real log burner they also moved us into there for our stay which was lovely especially for the time of year. Can't recommend this holiday let enough and we will be back. What can I say about Roundhouse Barn Holidays. You see I am running out of superlatives. We have stayed with them for many years now and consistently hit the mark and is backed up by the awards they have won. This stay in the carthouse was no exception, with it's luxury fittings and cosy atmosphere you will feel right at home immediately. I would say you can book any of their cottages without hesitation. We wouldn't hesitate to recommend staying. Everything about it has been put together with care, attention and guests comfort in mind. Barbara & Mark at Roundhouse Barns take pride in providing first class customer service . I was initially impressed with the efficiency at the booking stage and this continued throughout our stay. The Carthouse offers beautifully presented accommodation and includes a well equipped kitchen, very comfy bed and plenty of hot water. All of this you would expect in 5* accommodation but it was the extra little touches and treats that made all the difference such as a warm welcome, homemade scones, fresh flowers, bath crystals for a hot soak, postcards, full sky package, restaurant recommendations and even helpful instructions on how to to avoid the roadworks. Nothing is too much trouble and the owners work very hard to ensure you have everything you need to enjoy your holiday. 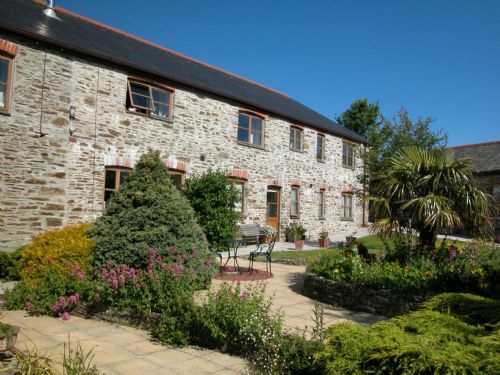 The location is tranquil and perfectly located to explore all of the Roseland coast. We would not hesitate to recommend Roundhouse Barns and intend to return again in the future. We have spent a weeks holiday at Roundhouse Barns for the past 3 years principally because of the very high quality and attention to detail provided by Barbara and Mark and because of the location. We have been using s/c accomodation for a few years now and this is , so far , the best we have experienced. We are very fussy and find it is like most things in life, you tend to get what you pay for. If you want cheap and tatty , don't go here, but if you want quality and consistency look no further. The location, in our opinion, is one of the most beautiful in Cornwall. We have stayed at Roundhousebarn cottages for the last few years. We enjoy the peace and tranquillity if the area as well as the quality of the cottages. Never disappoints. Barbara and Mark are perfect hosts. We have returned 6 or 7 times and always breath a sigh of relief when we arrive. Mark and Barbara are the most wonderful hosts. We usually book our next week before we leave. A lovely place to stay, totally unwind and relax! This was my first visit back to Roundhouse Barn for about 5 years. I'd previously stayed in The Dairy - one of the other cottages in the complex. Despite the lapse in time it was almost like coming back home again! Mark & Barbara Sadler have nailed self catering perfection with this wonderful retreat. Every comfort and attention to detail is in this cottage! 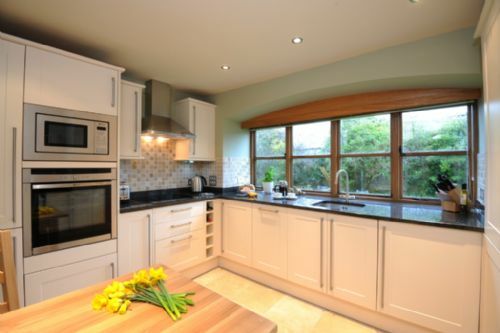 So if you do fancy a bit of cooking you have the pleasure of a fully equipped kitchen. If you don't fancy life in the kitchen you'll find a very informative guide listing local eateries all within a good distance of your holiday home. You'll sleep well too in the fabulous kingsize bed! The bedroom has ample wardrobe space and plenty of drawers to store things. The living room is tastefully furnished and is equipped with midi music system and Bose docking station, not forgetting the TV complete with full Sky package and DVD player! To compliment the music system and DVD player you are also provided with a good selection of CD's and DVD's. By the way there's a great little Pure DAB radio in the kitchen! Complimentary WiFi is also available and although not super fast it is more than adequate for normal 'surfing' and email activity. For those who like to read there's even a selection of books to choose from! So as you can see there's very little if any that hasn't been catered for in this lovely holiday home. You'll enjoy complete privacy throughout your stay, but if anything did go wrong you're never more than a few steps away from your hosts and help! Loads of brilliant places to visit are all within good driving distances; Trelissick Garden, Lost Gardens Of Heligan, St Ives, Mevagissey, Falmouth and Truro just to name a few! You're also in the beautiful unspoilt Roseland - so plenty of opportunity to take a good walk inland and along the fabulous coastline! I love this place and can confidently endorse a visit to anyone else checking this review! A brilliant property in a great surrounding. We stayed in the Carthouse which was amazing.5* luxury.Ideal place to stay for visiting all of Cornwall.King Harry ferry just five minutes away which saves you about 15 miles driving.Expensive if you use it every day but you get a 50p voucher off each return journey from Roundhouse Barn making it £7.50 return. From the moment of booking, we had a great information flow regarding our short break stay, all made personal by owners Mark and Barbara. The cottage is pleasantly tucked away, but still within short drive to St Mawes. Accommodation is truly comfortable, with all details carefully thought out and it made our stay special. We will definitely be returning, for longer next time! The accommodation was of an extremely high standard... the owners had thought of everything to make our stay as comfortable and relaxing as possible - even providing a real Christmas tree which was a lovely surprise on arrival, and its these extra touches that sets Roundhouse Barns apart from other holiday cottages. We hope to return again soon and would not hesitate in recommending the cottage to others. This being the 3rd stay at The Carthouse for myself and my wife we knew pretty much what to expect of the accommodation and we were not left wanting. There is everything contained within The Carthouse to make your stay comfortable and peacefull, and the area is wonderfull for sight seeing, walking, and wining and dining. We would have no hesitation in returning to The Carthouse in the future. Roseland Barns is a little piece of something special, I have loved the area since first took the children there years ago and to return to this centrally located home from home was the icing on the cake. We have stayed at many places as a couple in the UK and finding accommodation like Roseland Barns is not an easy task - Barbara and Mark have created something special and all you need to do is book, turn up and enjoy! 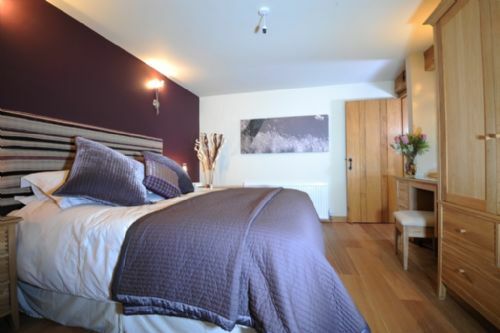 The cottage is well decorated with most home comforts and the bedroom is very well appointed. There was no one to show us round when we arrived but we managed to find most things in the end. Sadly we managed to set off the fire alarm by burning some toast but it went off within 20 minutes. We were amply warm in the evening once we has sussed how the log effect fire worked. Extra instructions written by a human being would be useful here. There is no landline and the mobile signal in the cottage is very weak so it might have been problematic if there had been a medical emergency in the middle of the night. The library is well equipped with maps and guidebooks and the cottage is well situated for exploring the Roseland peninsula. We ate out a lot so did not make extensive use of the cooking equipment but the hob was not one we had come across before and it took us a while looking for the instructions then translating them into ‘human’ English. I cannot over stress the importance of these reviews with people keep coming back to Roundhouse Barn Holidays you may think the owners would eventually drop the ball! I am most please to say this definitely not the case. The exceptional high standard of these cottages cannot be over emphasised and after returning many times we always leave refreshed and wonder how the owners keep the place in such an immaculate condition. It's not cheap, but worth every penny, oh it's Adults only so no children in sight. everything was perfect. Location excellent for touring by car in Cornwall. We enjoyed our one week stay very much and had a good time in the carthouse. You need defenitely a car for your stay and zou need a GPS to find the Roundhouse Barn. This was our second stay at the Carthouse and we were not disappointed. Everything was excellent as before. Go there, you will love it as we have and return again. Apart from enjoying the excellent location for touring the beautiful area we really appreciated the peace and quiet at the accommodation. It is not often that you can go somewhere where there are no children and it is just for couples. It was very refreshing and relaxing. We literally heard nothing more than the Thrush outside the window every morning! We stayed in The Carthouse and were delighted with the high standard of accommodation and little touches that Barbara and Mark included to make our holiday memorable. From the moment we arrived we felt welcome, Mark has certainly got a special touch with his homemade scones and Cornish cream! We are hoping to return. We've just returned from a thoroughly enjoyable week staying at The Carthouse at Roundhouse Barns; our fourth annual visit. The high standard of the accommodation has been maintained and the welcome from the owners is always particularly appreciated. Their attention to detail cannot be praised highly enough. We will certainly be returning again in the future. Not much to say really as this is the best luxury holiday cottage we have found through Premier Cottages and we have stayed at quite a few over the year. Highly recommended. Thanks so much for the kind review, so glad you enjoyed your stay at The Carthouse. You are right about the mobile phone signal, definitely best to go to the top of our drive to get a good reception. We have recently invested in satellite broadband and a new WiFi system to try and improve the speed of internet access. We are still having a few teething problems and the installers are back this week to try and improve the performance. However, it is one of the few downsides of living in such a beautiful location! Our fifth visit to Roundhouse Barns which really says it all. The Carthouse is superbly equipped and a great base for sightseeing or simply relaxing. We have self-catered for many years, both at home and abroad. Roundhouse Barns is one of the best we have ever stayed in. Beautifully decorated and very well equipped, it is set in peaceful countryside, with great walks on the doorstep. Aimed specifically at couples, Barbara and Mark provide the warmest of welcomes and nothing is too much trouble for them. If you can't bear the thought of looking after yourselves, then book into their B&B, where your every need (except dinner) is catered for. We highly recommend a stay.